Fire behavior on the Taixtsalda Hill Fire (#357) was active on Wednesday, with several smoke columns visible from the Alaska Highway. The fire is now 21,985 acres in size, an increase of 1,485 acres. 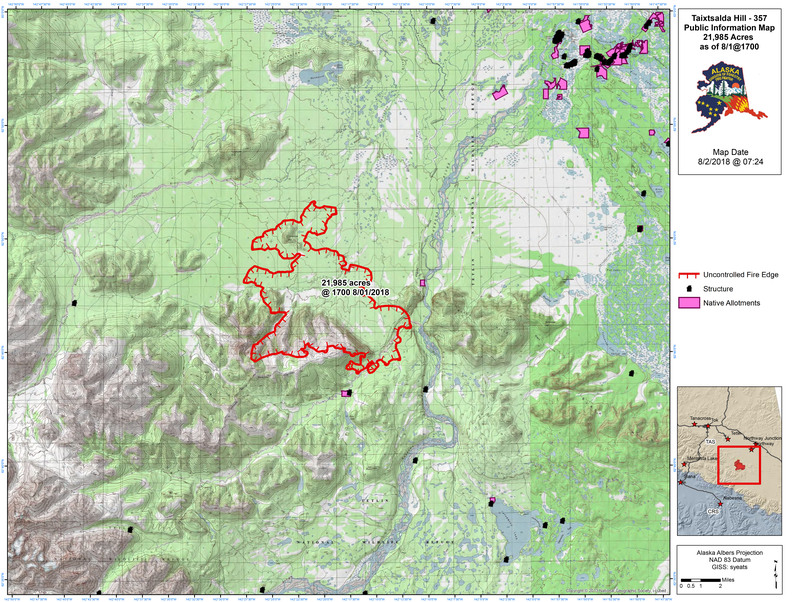 A perimeter map of the 21,985-acre Taixtsalda Hill Fire that illustrates how close the fire is to Native allotments and structures. The fire, which started July 23, is burning in a remote area approximately 14 miles southwest of Northway and 38 miles southeast of Tok. It is approximately 20 miles west of the Alaska Highway. There are 158 personnel working on the fire, which is being managed by the Alaska Division of Forestry. Operations to protect property and cabins continue in areas closest to the fire’s perimeter. Today’s weather is forecast to be cooler, with a high around 68, and light west winds. Minimal precipitation may begin and continue for the next two days. fuels within fifty feet of the site. A resource advisor is preparing a suppression repair plan to guide restoring areas impacted by firefighting efforts. This may include pulling vegetation back over disturbed ground and constructing water bars on the fireline to reduce erosion. The temporary flight restriction over the fire area was enlarged to provide a safe environment for firefighting aircraft as the fire grows. There are multiple firefighting aircraft flying in the area. To check on the coordinates of the revised TFR, pilots can go to http://tfr.faa.gov/save_pages/detail_8_8698.html . For more information, call the fire information line at (907) 707-9866.